Cooking three recipes simultaneously requires a strategy. 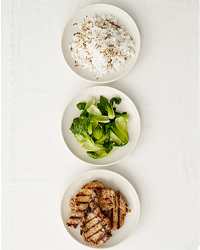 That's what the F&W Test Kitchen provides for the meals on these pages, each comprised of a delicious main and two sides. Marinate and grill flank steak. Wine Pairing: This flavorful steak demands a weighty red with good acidity. The Carmenère grape from Chile is a great pick. Try Chono's berry-rich 2007 Reserva bottling. Wine Pairing: Vibrant Pinot Noir: 2007 Peregrine from New Zealand. Wine Pairing: Zesty white Alsatian grape varieties go well with Asian-inspired dishes. Anne Amie's juicy, citrus-scented 2008 Pinot Gris will pair well with all of the flavors here. 1. What is an unexpectedly delicious pairing with fried chicken?